Let’s analyze this installment of Time Trabble. First we see a panel that is practically the same as the first panel to the comic “New Orleans”. Our protagonist wears a purple shirt that says “New Orleans”. Are these two unnamed characters related; possibly brothers? It would explain the similar behavior. 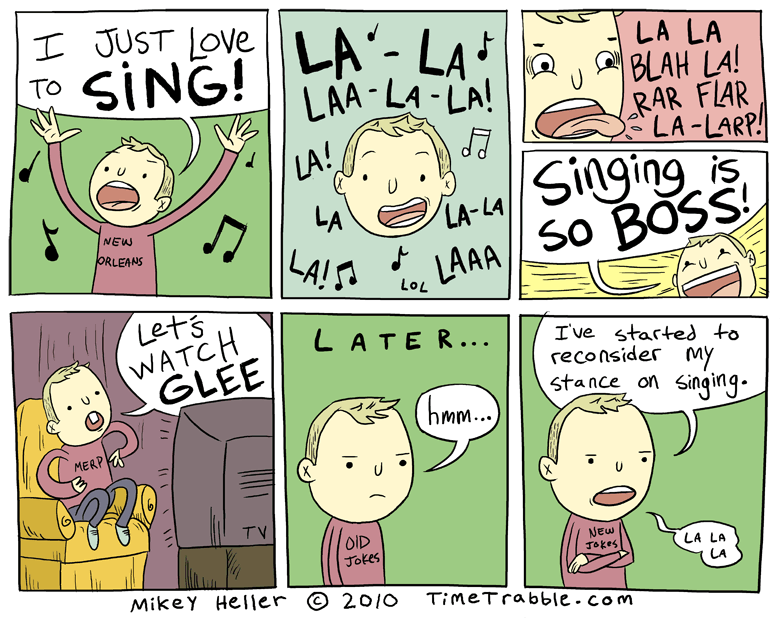 And what is this saying about Glee? At first glance we may see that the author may be taking a negative stance on the FOX progrum, but then we are left with the character singing a few notes under his breath. So we cannot assume his new stance on singing is that it is no longer “the boss” but possibly something more complicated. Glee has a 8.8 on imdb. I used the “strong” html tag. I wonder what it will do. Ha, it’s your drawing style that makes the comics funny. People need to get over themselves and admit that there’s something on TV that’s not Arrested Development. I agree, Steve is a Wanker. And he probably smells. Lol I love these comics 🙂 We think like exactly alike!